Blurred vision, glare sensitivity, difficulty in reading in low light and declining night vision are typical symptoms as cataracts develop. Glasses and medication are usually ineffective in improving visual loss caused by cataracts. Each year millions of people undergo cataract surgery. It is one of the most common and successful procedures performed in the world. 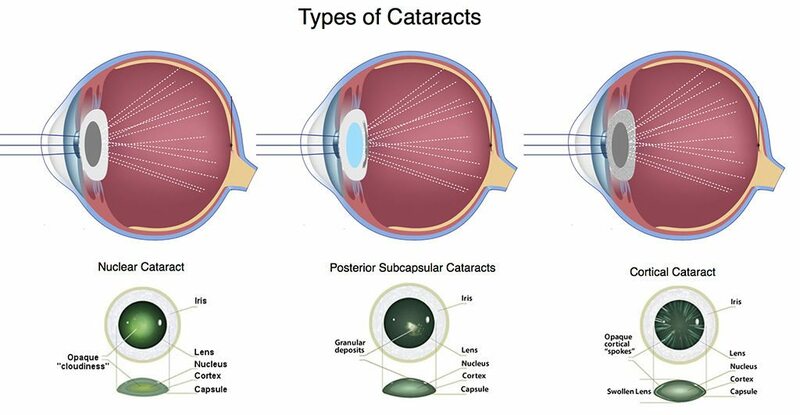 A cataract is a gradual, progressive clouding of the eye’s natural lens, which causes glare, gradual loss of sight and other hindrances to normal vision. Over 50 percent of people over the age of 60 have a cataract and the majority of people will develop some degree of cataracts during their lives. Cataracts develop because of a natural aging process in the eye’s lens. 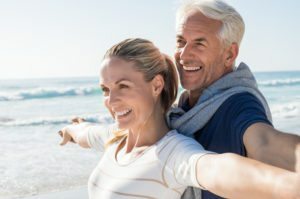 Ultraviolet (UV) exposure may play a role, and some cataracts are caused in younger people by trauma, systemic conditions or vitamin deficiencies. Most people start to experience issues at night, especially while driving. Car lights can have an unusual impairment on night vision and street signs can become difficult to read. 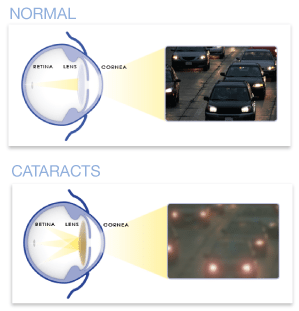 Glare and halos at night are very common in patients with cataracts. Colors also appear faded and not as vibrant. Although, cataracts form so slowly over time, patients don’t typically notice the loss of vibrancy with colors. Patients also start to require more and more light in order to read well. Patients might also feel that they need a stronger prescription for their glasses, but eventually, glasses no longer help and the cataract must be removed. Some patients even experience double vision when looking through only one eye. An eye exam from an optometrist or ophthalmologist can help quickly determine if you have a cataract. If you feel like cataracts are impairing your vision, call our office today to schedule an evaluation with one of our skilled ophthalmologists. We no longer recommend waiting for the cataract to mature before considering surgery. Now, the decision for surgery is based on visual difficulties interfering with normal, daily activities like driving or reading. Today, cataract surgery is fast, safe and only takes minutes to perform. Modern cataract surgery also has a quick recovery time, with most patients being able to drive the next day. Also, with the advent of premium IOLs, patients can reduce or even eliminate their need for reading glasses or bifocals.